Though he’s not even celebrated his 11th birthday, Max Charles is not a household name but has a resume that should suggest otherwise. Ariel Winter is best known for her role as geeky Alex Dunphy on ABC’s Modern Family and her work ethic is just as impressive. Together, they’re the unlikely duo that team up to travel in the WABAC throughout history in Mr. Peabody and Sherman, in theaters March 7, 2012. I had the chance to interview the actors about their roles in the film that is the full feature version of the 1960s cartoon that so many loved. The new version is a new vision, including a character that wasn’t in the original cartoon – Penny. 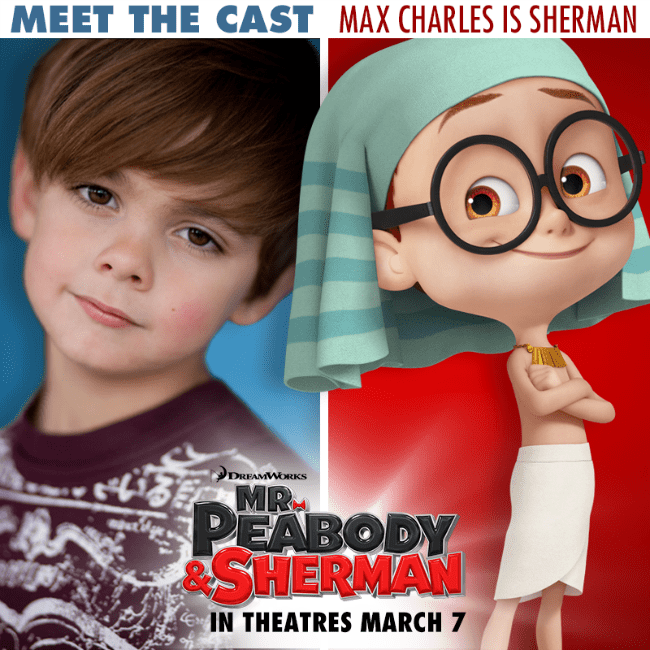 Max Charles, who is the voice of Sherman in the film, was just as expressive and absolutely adorable to interview. We asked what he enjoys doing when he’s not acting; his answer was one that we would expect from any kid his age. A kid of many talents, I wasn’t surprised he was able to be so successful at such a young age but still so down to Earth. Read about our interview with the film’s director and producers here and be sure to catch Mr. Peabody and Sherman in theaters March 7.